Streetcar No. 1051 turning at the corner of Noe & Market, one block from Castro. On Tuesday, October 28, at 11 a.m. at Castro and Market Streets, PCC streetcar No. 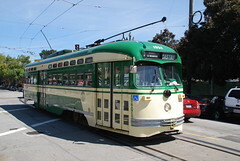 1051, painted in Muni’s 1970s green and cream “simplified” livery, will be dedicated to Harvey Milk for his advocacy of public transit during his all-too-brief tenure as a member of the San Francisco Board of Supervisors in 1978. At that time, Milk was the only member of the Board who rode Muni every day, and he was the first Board Member to use the then-new Fast Pass regularly. The dedication is co-sponsored by Muni and Market Street Railway and will complement the many other tributes paid to Harvey Milk as a human rights pioneer. The public is invited to attend. The choice of this trolley to honor Harvey Milk is based both on its livery — the same as the streetcars he rode every day from the time he was elected Supervisor to his assassination on November 27, 1978 — and on the fact that this streetcar makes an appearance in the new movie “Milk” which has its world premiere that same evening, October 28, at the Castro Theater.